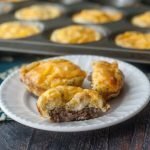 These low carb breakfast sausage egg cups make a delicious low carb grab and go breakfast or snack. Make ahead and store in the freezer for an easy low carb breakfast. Cut the sausage into 12 pieces and form into little patties that will sit on the bottom of each cup in the muffin tin. Add salt and pepper to the eggs and cream and beat. Pour over each piece of sausage and top with half a slice of cheese. Can be stored in the refrigerator for 3-4 days or you can freeze them for later. To reheat, just cook in the microwave for a minute or two.